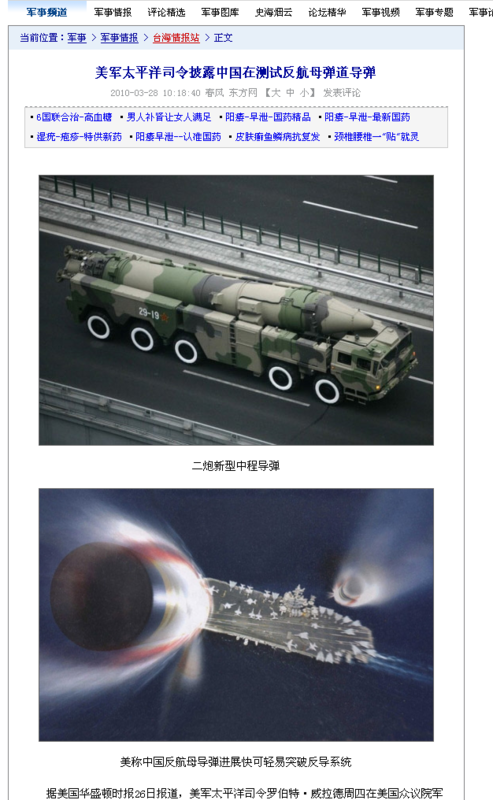 If they can be deployed successfully, Chinese anti-ship ballistic missiles would be the first capable of targeting a moving aircraft-carrier (.pdf) strike group from long-range, land-based mobile launchers. And if not countered properly, this and other “asymmetric” systems — ballistic and cruise missiles, submarines, torpedoes and sea mines — could potentially threaten U.S. operations in the western Pacific, as well as in the Persian Gulf. Willard’s disclosure should come as little surprise: China’s interest in developing ASBM and related systems has been documented in Department of Defense (.pdf) and National Air and Space Intelligence Center (.pdf) reports, as well as by the Office of Naval Intelligence (ONI) and the Congressional Research Service. Senior officials — including Secretary of Defense Robert Gates, Director of National Intelligence Dennis Blair (.pdf) and Chief of Naval Operations Admiral Gary Roughead — have pointed to the emerging threat as well. When someone of Bray’s stature makes that kind of statement, attention is long overdue. Equally intriguing has been the depiction of this capability in the Chinese media. A lengthy November 2009 program about anti-ship ballistic missiles (video) broadcast on China Central Television Channel 7 (China’s official military channel) featured an unexplained — and rather badly animated — cartoon sequence. This curious 'toon features a sailor who falsely assumes that his carrier’s Aegis defense systems can destroy an incoming ASBM as effectively as a cruise missile, with disastrous results. Likewise, Chinese media seem to be tracking PACOM’s statements about this more closely than the U.S. press. The graphic above is drawn from an article on Dongfang Ribao (Oriental Daily), the website of a Shanghai newspaper. Beijing has been developing an ASBM capability at least since the 1995-96 Taiwan Strait Crisis. That strategic debacle for China likely convinced its leaders to never again allow U.S. carrier strike groups to intervene in what they consider to be a matter of absolute sovereignty. And China’s military, in an apparent attempt to deter the United States from intervening in Taiwan and other claimed areas on China’s disputed maritime periphery, seems intent on dropping significant hints of its own progress. U.S. ships, however, will not offer a fixed target for China’s DF-21D anti-ship ballistic missiles. Military planning documents like the February 2010 Joint Operating Environment (.pdf) and Quadrennial Defense Review (.pdf) clearly recognize America’s growing “anti-access” challenge, and the QDR — the Pentagon’s guiding strategy document — charges the U.S. military with multiple initiatives to address it.